The fall of this Soviet satellite was not unexpected. Shortly after its launch on September 18, 1977 its orbit had become unstable and some people began to fear it could hit a major center of population and kill hundreds of thousands of people! While this was unlikely, there were well-founded concerns that there could be radioactive contamination of whatever area of the earth the satellite finally struck. As Cosmos 954 broke apart pieces were scattered from the East Arm of Great Slave Lake almost all the way northeast to Baker Lake. No one knew whether or not the core of the nuclear reactor onboard the satellite had completely burned up on reentry or if it had contaminated a large part of the Northwest Territories. The Canadian and American military joined forces and began Operation Morning Light, the search for radioactive debris. One of the first tasks was to check for signs of radiation in Yellowknife. Twenty-five Nuclear Accident Support Team members descended on Yellowknife during the evening of January 24th. Dressed in yellow radiation suits and gas masks and carrying Geiger counters they put quite a scare into local residents but fortunately found no signs of radiation. The next step in the operation was to determine whether or not the disintegration of Cosmos 954 had left a radioactive cloud that could drift over some populated area. The Americans had a specially equipped U2 spy plane that flew the route of the disintegrating satellite and once again there were no signs of radiation. Within a day of the reentry there were other specially equipped airplanes and helicopters looking for radioactive materials on the ground along a 50-kilometre wide swath beginning 80 kilometers southeast of Yellowknife and running 800 kilometers northeast to Baker Lake. They examined an area of 40,000 square kilometres and the first radioactive 'hit' was made on January 25th 300 kilometers northeast of Yellowknife. This was quickly followed by another 'hit' on the ice of Great Slave Lake just off the mouth of Hoarfrost River. News of the reentry of Cosmos 954 and the discovery of radioactive materials on the ground in the Northwest Territories became front-page news around the world. On January 28th the Yellowknife Meteorological station received an exciting radio message from a cabin in Warden's Grove along the Thelon River. Six men staying at this cabin had found pieces of metal protruding from the surface of the Thelon River, pieces that proved to be part of the satellite. After more than a month of searching and finding only radioactive pieces of metal that had contained, or had been close to, the core they began to find, in an area south of the original search area, microscopic pieces of fissionable material from the reactor core itself. From the pattern of dispersal it was apparent that the core had only partially burned up and that 80,000 sq. km. of land east of Hay River had received a light dusting of highly radioactive material. Using sensitive airborne detectors the military pinpointed and retrieved the largest pieces, including one that was a few centimeters long and would have quickly killed anyone exposed to it for any length of time! By the middle of March all detectable pieces had been picked up although the military continued to monitor the situation throughout the summer and fall of 1978. 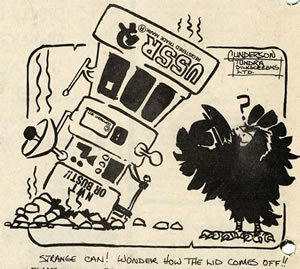 Cartoon from the February 9, 1978 Yellowknifer.